Time had come to get from Dubrovnik to Albania. We had tried to search online for how to get there before we went on the trip, but we could not really conclude how to go. 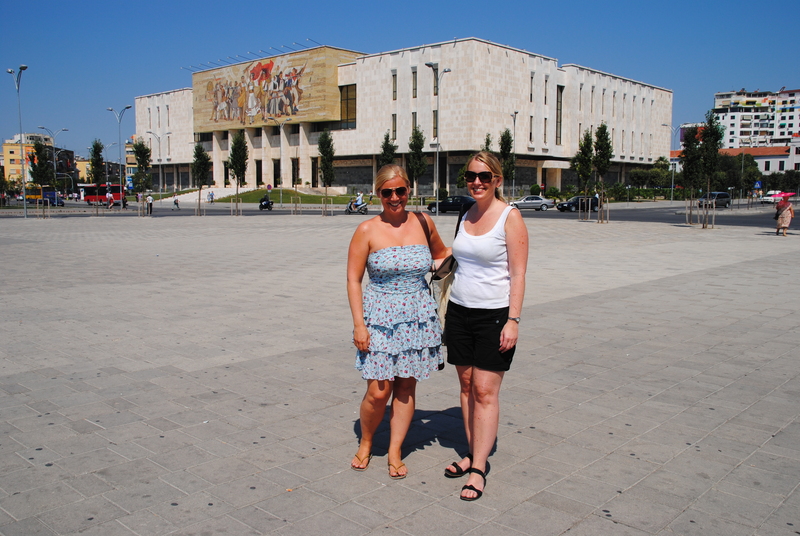 We then decided to find out when we got to Dubrovnik. That turned out to be harder than expected. 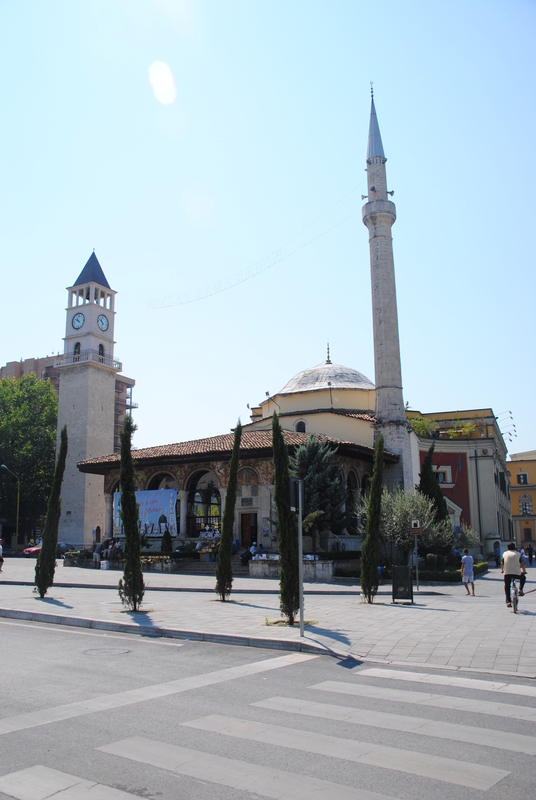 We tried to ask at the tourist information, but our request was answered by a question; “why do you want to go to Albania?”. It ended with the conclusion that we just had to get to Montenegro and find our way as we went along. 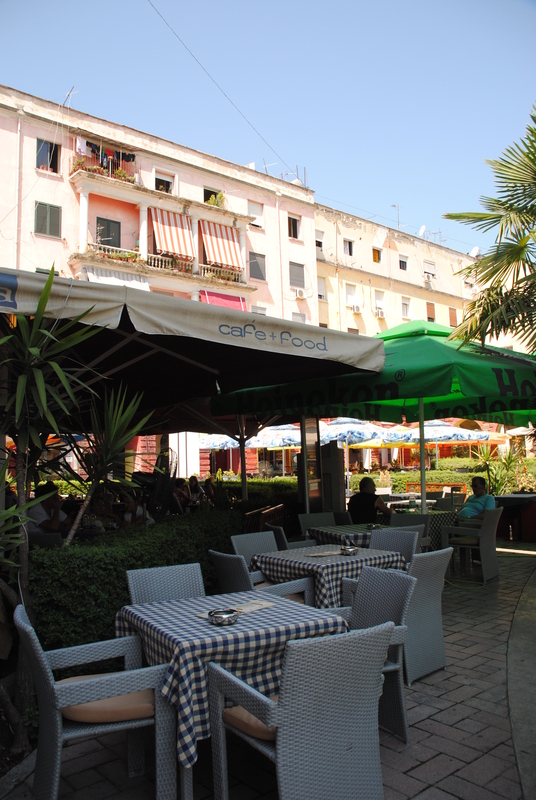 We headed for the bus station in Dubrovnik to take the bus at 10.00 to Budva via Kotor. When we got to the ticket office, the tickets for the bus we wanted were sold out. We did not even think of that. Needless to say, it was not exactly the message we wanted. So lesson number one: If possible, buy tickets in advance… But, there was a bus number two at 10.00, or at least it should leave at 10 as well, but the problem was that it arrived from Bosnia, and were usually delayed. The only thing we were told was that it usually arrived sometime between 10 and 12…. This day we were extra lucky, and while we were waiting it was announced it would arrive around 12.30. But, luck happily changed for us, and some of the passengers with tickets for the first bus did not show up, so we got on that one. When we got to the border between Croatia and Montenegro there was a huge line, that made us wait there for 1,5 hours. The air-condition in the bus did not work very well, so it was extremely hot. When we finally got passed the border, we drove through beautiful scenery along the bay of Kotor. I spent a short time in Kotor some years ago, but if we had more time, I would definitely wanted to stay there one night to see more of the small charming town. But, our bus continued after a very short stop, heading for Budva. On our way we had read in our guide book that Ulcinj or Schodra were places with connections to Tirana. So, when we arrived in Budva, we decided to go to the one of those two places the next bus went to. It seemed the luck was with us that day, and the next bus to Ulcinj was in 20 minutes. The ticket was 6 Euro + 1 euro for each piece of luggage. After about two hours in the small bus we arrived in the little town of Ulcinj. 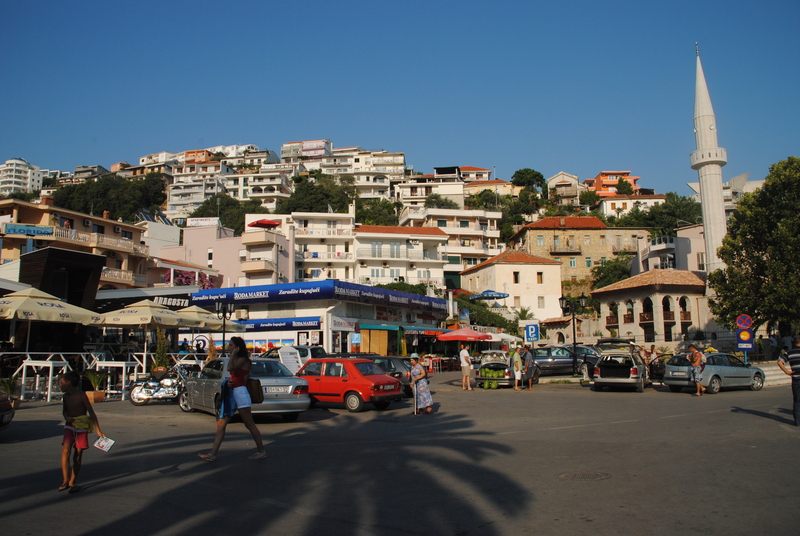 When we got there, we found out there were two daily busses from Ulcinj to Schodra, leaving at 06.00 and 12.30. In other words, we had to spend the night. On the bus we had met two Swedish boys that also were heading for Albania. A local man that claimed he worked for the local tourist office came over and asked if we needed a place to stay. Off course we realized that he did not work for them, but we needed a place to stay and it was an easy solution to go with him. Before we knew it, we were sitting in his car, heading over to his house to share a room with four beds. 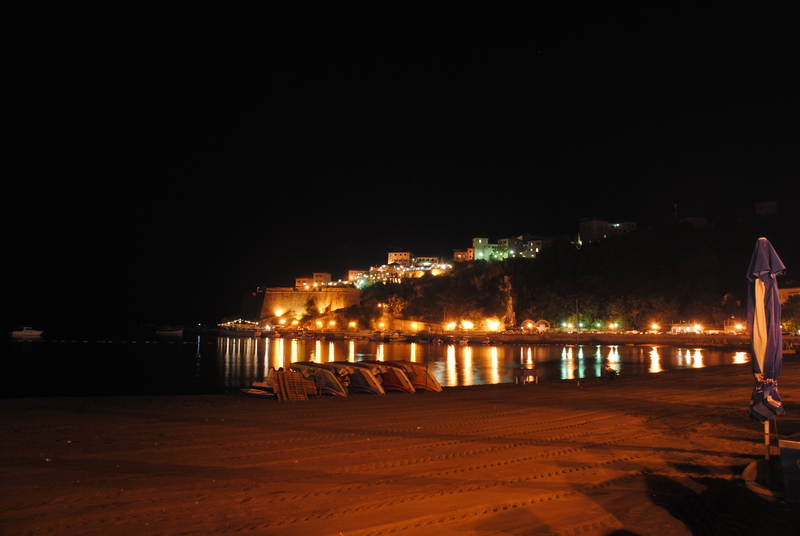 Ulcinj was a nice little town with a main street leading down to the beach. On the top of the hill in one of the ends of the beach, the old town was situated. As we had decided to go further with the bus at 06.00 the next morning, we just had dinner and a drink by the beach, and never got to see the old town except from a distance. Sunday morning we walked down to the bus station to take the bus to Schodra. It took about 1,5 hours, and when we stopped along the road, a mini bus to Tirana was waiting and left as soon as we got on it. 1 hour and 20 minutes later, we arrived in Tirana. It was no bus station where we were left of, but we later learned that the buses heading in the different directions went from different places just along the streets. We had decided to go to Berat and spend the night there, but wanted to see some of Tirana before we continued. We walked around in the heat for quite some time looking for a place to store the luggage for a few hours. It was more difficult than we imagined, but just when we were about to give up, we asked at a hotel if they could be so kind to look after our luggage for a while – and they were. As we had not eaten yet, we first looked for a place for lunch. We sat down in the shadow by the Opera, but found out that they did not serve food. Either way, we needed the rest and something to drink, so we stayed there for a while. We asked the cute girl that sold ice cream if she had any recommendations where we could eat lunch. She was very helpful and pointed out a small square behind the big casino that had several restaurants. 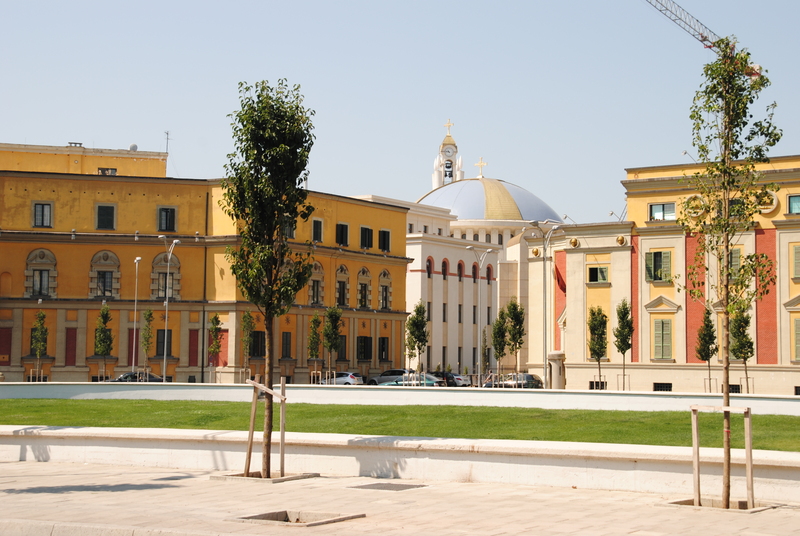 We also asked her what she recommended that we should see the short time we spent in Tirana. She looked out on Skanderbeg Square, and said; “this”. Obviously there are so many other things to see, but right then and there we were so hot and tired that we took her word for it. On our way to the “lunch square” we passed a church side by side with a mosque. It is nice to see that religions can live peaceful together. Further we also passed by a nice park with a nun sitting on the lawn resting. She looked very peaceful, it was almost as seeing Mother Theresa relaxing in the shadow. Now and then several wedding parties were driving by celebrating, taking us back to the busy reality. On our way back to get our luggage, we passed the Orthodox Cathedral. Bus at 10.00 from the bus station in Dubrovnik to Budva, via Kotor. REMEMBER TO BOOK THE TICKET BEFORE TO BE SURE TO GET ON IT! Ticket price: Appr. 130KN per person + a fee for the luggage. Bus from Budva to Ulcinj at 15.00 (appr. 2 hours drive). Ticket price 6 Euro + 1 Euro for luggage. If you are in a hurry and really need to get to Albania in one day, we heard it was possible to get a driver to drive to the border, where it usually were several others on the Albanian side to take you further. We on the other hand, decided to stay one night in Ulcinj and take the bus at 06.00 to Schodra (1,5 hours, 6 Euros). Just let them know that you will continue to Tirana, and they know where to let you off. 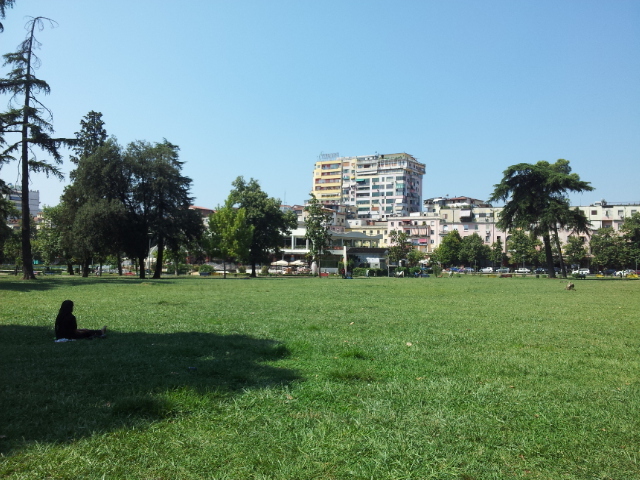 From there we took a mini bus to Tirana (1h 20m, 5 Euro). Pingback: Getting to Albania | Life is a journey! 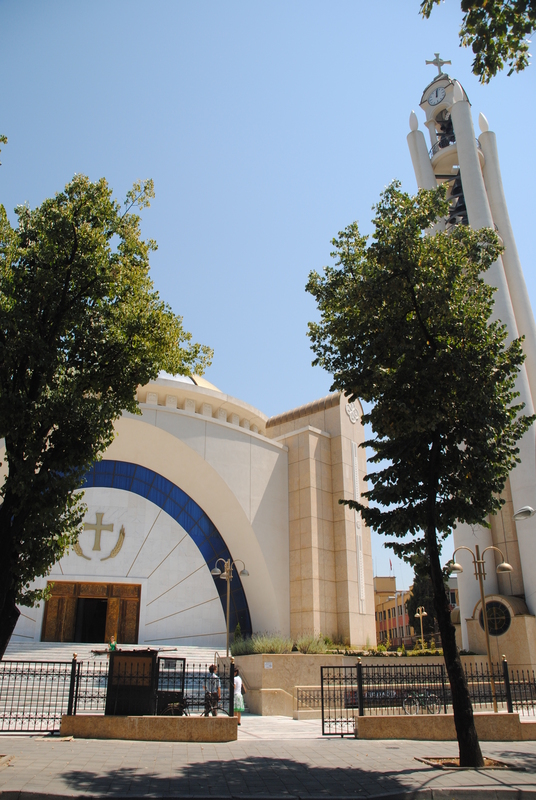 Pingback: The detour via St. Naum Monastery to Tirana | Life is a journey! Pingback: Ulcinj | Life is a journey! Vi leide en taxi fra Ulcinj til Shkodra. Det ble omtrent samme pris som bussen,og tok 40 minutter. Heldigvis traff vi 2 andre på busstoppet der slik at vi var 4 som delte på taxi utgiften, men det funket greit siden det var så få busser den retningen! Vi bare tok en taxi fra busstasjonen i Ulcinj, kostet omtrent det samme som bussen, og tok bare 40 minutter. Vi traff noen andre som skulle samme veien, og delte utgiften til en taxi (30€) til Shkodra. Det var ganske greit siden det er såpass dårlig busstilbud der! Sorry, den kom 2 ganger!